Born in Bordeaux in 1973. 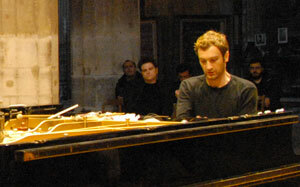 On completing his studies in Mathematics and Physics at Bordeaux University, Frédéric Blondy dedicated himself full time to music, firstly as a jazz pianist and subsequently as a student at the Bordeaux National Conservatory where he studed piano, harmony, analysis and composition. Since moving to Paris he has worked with Marie-Christine Calvet at the “International Piano Center”, refining a body-based approach to the instrument. He runs for several years a regular workshops on improvisation and contemporary sound practices, first at the Instants Chavirés then as part of the Rendez-Vous Contemporains of Saint Merry. He is a regular speaker at the Cité de la Musique in Paris for workshops on contemporary sound practices and new creation tools.